PMW has exposed terror glorification on Fatah's Facebook page, group reiterates glorification in response and calls for continued terror. Palestinian Media Watch (PMW) has revealed numerous statements by Fatah on its official Facebook page glorifying terrorism. In response, the Fatah page reiterated its idolization of terrorists and called for continued terrorism. 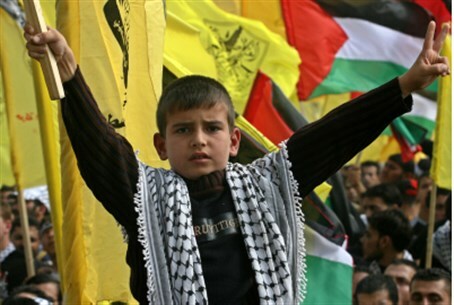 Fatah is the party headed by Palestinian Authority (PA) Chairman Mahmoud Abbas, who is currently engaged in peace talks with Israel. The group posted on its Facebook page on October 23 that Israel has been monitoring the page and relaying its contents to friendly nations, claiming that they constitute incitement to violence. An example post from last month lauded terrorist Issa Abd Rabbo, who was among the 26 recently freed terrorists in Israel's "gesture" for the peace talks, as a "national symbol," and pledged to "continue to walk in his path. In response to PMW's exposure, the Fatah page wrote "Israel, you oppose our posting photos of Martyrs (Shahids) on our page, [but they] are our role models for everything related to freedom." The text continued with a call for continued terror, expressing pride in the actions of the terrorists which "will lead us one day to the liberation of our lands and [freeing] our Jerusalem from your impurity." In September Fatah's military branch, Al-Aqsa Martyrs' Brigade, gave the green light for a terror war over Jewish visits to the Temple Mount, the holiest site in Judaism. Meanwhile, just this week a Fatah leader mocked Israel for releasing the terrorists, and told Israelis to pray for their dead and "die in your rage."